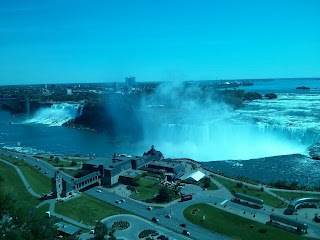 Niagara is a very lovely place to visit. A lot of water falling into more water. I don't see it as a yearly visit but it is nice to check it off of my list. Driving back from vacation has given me time to start catching up to what happened while I was away. Eve has a terrible habit of not stopping just because one happens to log off. It seems as if my boys were productive. They killed things and were killed. It seems that they bit at Procurer bait and it went sideways and upside down after that. I haven't picked up the details but from the amount of trolling and harassment of each other they are quite amused. Then, the group that set the trap recorded it and wishes to announce that we are terrible and they are awesome. So shall it be forever. Also several new apps are in or accepted. New members are healthy for the corp. Hopefully they don't mind that we are so terrible. 3D won a Ragnarok on Blink's celebration. I'm sure he is peeing himself he is so excited. It means no more PvE for him. a true Eve PvPer dream come true. He doesn't have a taste for blinged out battleships and T3s so I suspect he will be fat and happy of the wallet for a long time to come. Ueber won one of the all dockable ship sets. No surprise there. I think he was going for a Titan but somehow I hope he will survive. This is the second time I have had a short away from game break. I do not overly enjoy them. I do enjoy playing Eve. I don't return with some new realization reached where I throw down the chains of game play and run off to start hiking. The biggest thing it does is given me a break from the negatives while making me miss the positives. For instance. I have given up a forum I was reading because the over all tone of negativity, bitterness, and arrogance has worn on me. I finally said screw it and closed its tab and deleted the bookmark. I edited my twitter list as well. I don't believe in closing myself off from information and opinions that are different from my own. Some of those just don't give enough of a return for absorbing their negatives and when I find myself wondering why I am reading them it is time to stop. It has also broken me out of a gloomy cycle I was in, I believe. Taking time off is one thing but getting out of the house is another. My next stop will be Eve Vegas in October. But for that, I get to take the blog along on the ride. We've taken the kids up to Niagra in late October for the last 3 years. There is a massive indoor waterpart right downtown on top of a big parking garage. The boys love it - because of the time of the year we go, there aren't crowds at all, so the boys get to try everything repeatedly, with minimal (or no) waiting. Besides, I love a place where I can get served beer and nachos without wearing a shirt or shoes while overlooking my kids having a blast.